Allicia Russell is the 2015 Valedictorian for Marlette. Allicia ia the daughter of Mark and Michelle Russell. She has maintained a perfect 4.0 GPA. Allicia plans to attend Saginaw Valley State University to become a Pediatric Physical Therapist. 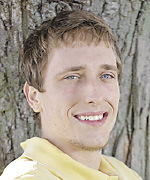 Christopher Blatt is the 2015 Salutatorian for Marlette. Christopher is the son of Carmen and Jerry Blatt. He plans to attend Michigan Tech, majoring in Computer Systems Science and minor in Computer Engineering in order to pursue a career as a Network Administrator.